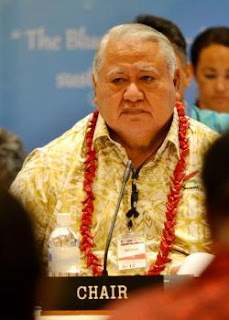 Samoan Prime Minister Tuilaepa Sa’ilele Malielegaoi is adamant the nation of Israel will not experience true peace until the penalty for their decision to crucify Jesus Christ is paid. That was his response when his government was queried in Parliament about why it did not vote during a controversial United Nations resolution demanding the United States to drop its recognition of Jerusalem as Israel’s capital. The issue was raised by Gagaifomauga No. 3 Member of Parliament, La’aulialemalietoa Leuatea Schmidt, when Parliament reconvened for the first Parliament Session for 2018 on Monday. “About Israel, I noticed that we were neutral during the vote,” La’auli said. The MP said Samoa should be at the forefront of efforts to recognise Jerusalem as Israel’s official capital. That’s when Prime Minister Tuilaepa took the floor. He said “vision” and “wisdom” must be exercised in such decisions. But Tuilaepa said there is a reason for war and strife in the area. The Prime Minister, who is a staunch Catholic, did not say when the penalty would be fully paid. Still, La’auli insisted. He said his point is a humble reminder for Parliament about Samoa’s governance with God and the constitutional amendment where Samoa is now an official Christian state. In another church-related matter, La’auli raised the objection by Congregational Christian Church of Samoa (CCCS) to the government’s decision to tax the Head of State and Church Ministers. La’auli, who is a senior Deacon of the CCCS Alamagoto, said their parish has received a letter from the “Malua Fono Tele” asking that nothing is done about the government demand for pastors to pay taxes until the CCCS makes an official decision during their annual conference later this year. Prime Minister Tuilaepa wouldn’t budge. He said the government’s new tax laws do not target church bodies; rather it is focusing on individual Church Ministers who have an obligation to pay their taxes. It is up to them to obey or disobey the law. The Prime Minister maintained that Parliament has already discussed the matter and their decision is final. When La’auli persisted with the matter, Tuilaepa raised a question. “Don’t bring your church stuff in here,” he said. “We all go to church and we all know what the Bible says about taxes and the law and giving Caesar what belongs to him. Leave your church stuff out there. Parliament has made a decision and that is it, said Pm Tuilaepa.